distribution Nearly throughout the Coastal Plain, and the extreme eastern and southern Piedmont. Absent from the mountains and the northwestern half of the Piedmont. Perhaps absent in a few counties in the northeastern Coastal Plain, such as those around Albemarle Sound. abundance Though recorded from most Coastal Plain and lower Piedmont counties, suggesting that it isn't rare, there are few recent reports, and just several photographs. Thus, presumed to be uncommon and overlooked within the range, if not in decline in numbers. Likely to now be rare in the Piedmont portion of the range, as (despite many observers in the Triangle region) there are no recent records from this province. flight In the Coastal Plain, the flight occurs from early May to early October, and the Piedmont flight is similar, though the earliest record is from late May. habitat Unusual for a damselfly: as the name suggests, it is found around blackwater (acidic) streams, rarely around larger rivers and lakes, but again with tannic (acidic) waters. However, several recent records have been at margins of lakes and ponds (in the Sandhills, where waters are acidic). comments It seems remarkable that Cuyler, and possibly others, have collected the species from 40 or more counties, yet there are relatively few recent observations. 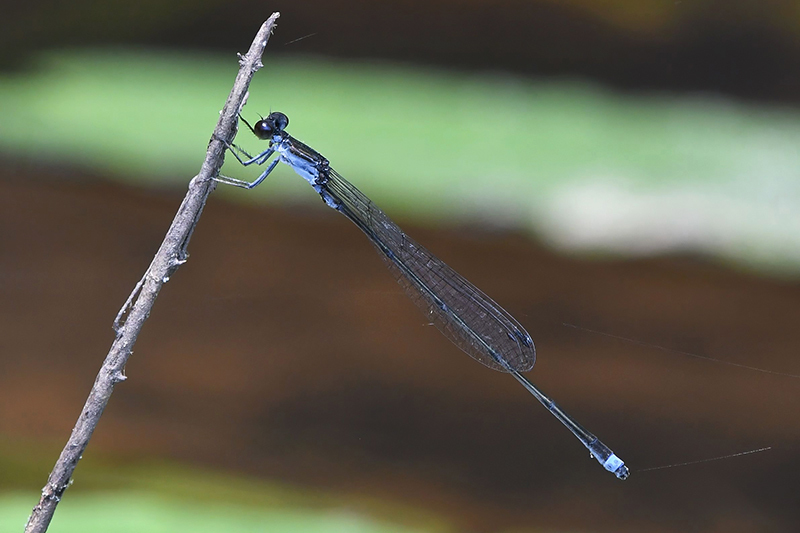 This scarcity of recent records is likely due to the fact that few observers look for odonates along blackwater streams; most field work is done around ponds, lakes, and larger creeks and rivers. Certainly a species that has been recorded (collected) in ecologically "impoverished" counties such as Edgecombe, Wilson, Greene, Lenoir, and Duplin cannot be that scarce. There are just a handful of known photographs available (so far) for the species in NC, and none as yet from the northern half of the Coastal Plain or eastern Piedmont.